Please note that this page is not fully up to date with this years workshop. Please see the Swedish version of the page to get the latest info, or contact us! 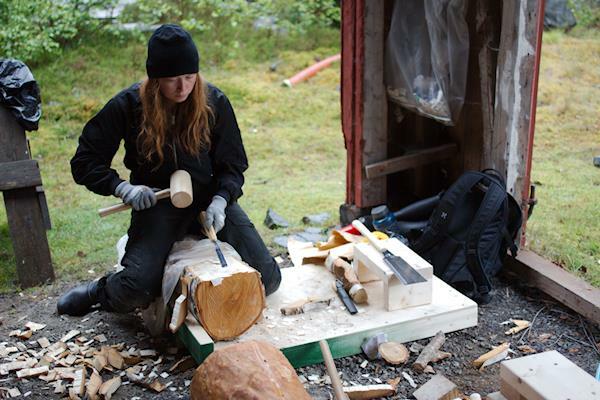 Student working on a fresh log during the 2016 workshop. During the workshop you will practice a method for wood sculpture that lends itself to efficient work in larger as well as smaller formats. The technique stems from Japanese tradition. You will work in different sorts of wood to get to know the possibilities of the material in the making of art and sculpture. Svarta Bergen old quarry, Hägghult. View from north. 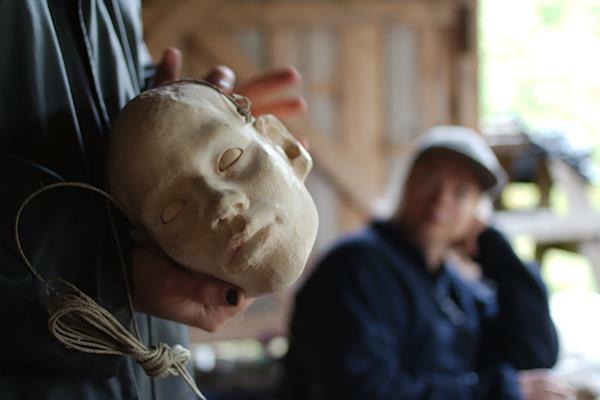 The workshop is in a basic level and will suit the beginner aswell as the sculptor looking for deeper knowledge. Our intent with the workshop is to build a solid foundation of knowledge for the beginning wood sculptor and a scenic rescidence in a relaxing inviroment. 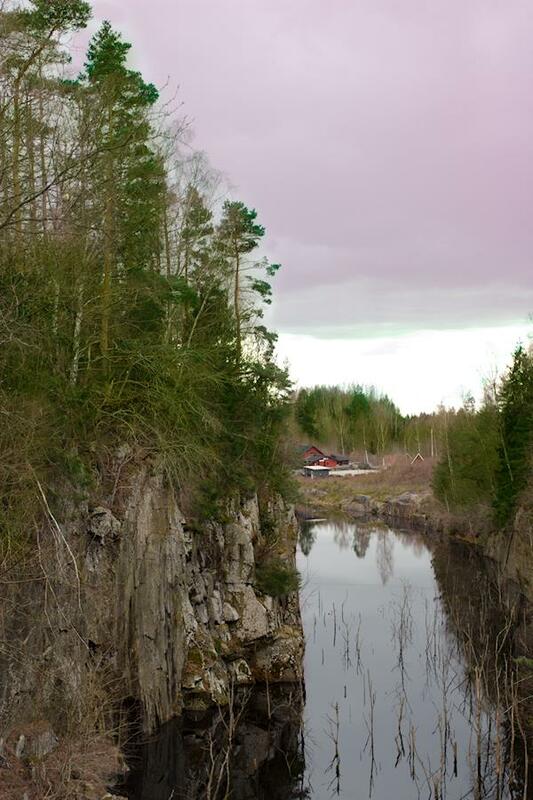 The workshop takes place in the old Svarta Bergen quarry, famous for its world renowned black diabase rock. In the valley next to us, diabase is still quarried to be shipped all over the world for use in buildings and monuments. Many phases of the workshop is physically exhausting since we mainly will use hand tools and work in a relatively large scale. When we work with hand tools we will get to know the features of the material and how to use them in the artistic expression. Sign up for our newsletter to receive news about this and other workshops! Facebook event for this workshop. Julia Bondesson, The Guardian (detail), 2014. Wood (linden and salix capera), textile and oil. 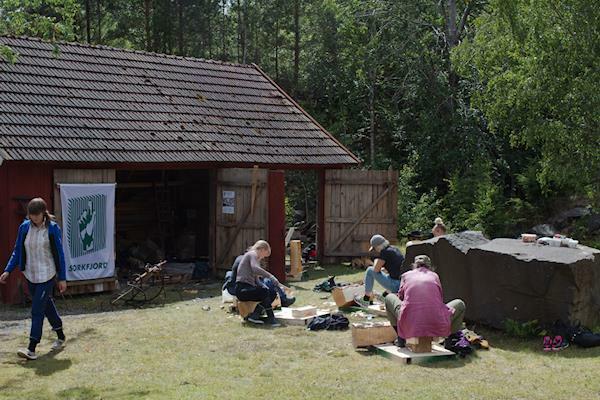 The workshop fee includes wood material for the exercises, hostel accommodation and entrance to the Svarta Bergens arbetslivsmuseum. At the end of the workshop the participants will be handed all written material for the lectures and a workshop certificate. The course is open for 10 participants. No previous knowledge needed and we practice a first-come, first-serve policy. Every day begins with a softening stretch that prevents damage to the body. Then lectures are followed by sculptural exercises. In the initial phase of the workshop you will study basic shapes, such as cubes and spheres. Then we move on to a free expression where your own ideas and sketches will be the foundation of the work. Tuition takes place between 09:00 am and 04:00 pm. You have access to the workplace around the clock. The pase of the workshop is high and we do not expect the participants to complete all the exercises during the workshop. Instead, we introduce a variation of exercises, after which you choose what you want to focus on. The workstations are easy to move and when the weather allows we work outside on the lawn. Characteristics of Swedish woods' for wood sculpture. Work with knife and axe. Safety with cutting tools. 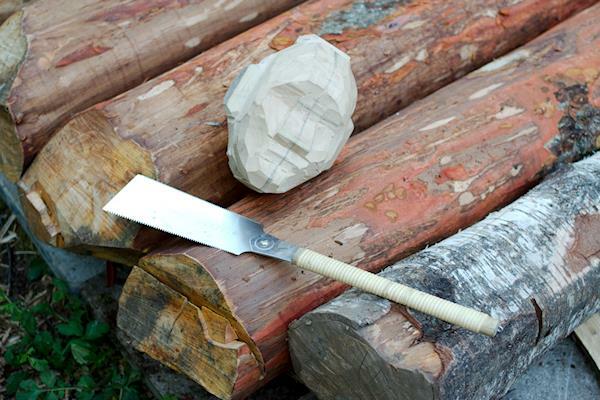 Work with sawing tools: hand saw, japanese saw and electric saw. Work with wood chisel, gouge and hammer. Drying wood and how to repair cracks. Carve in different types of wood. Sculpt a cube and a sphere in fresh wood. Sculpt a simple solid object (max 35×30×25 cm). Sculpt a more complex object, with holes and protruding parts in a free scale. 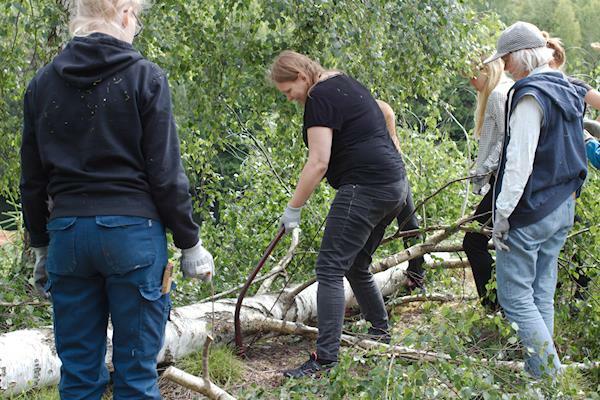 The workshop starts Monday 25th of June and the participants will meet up at Lönsboda station at 08:30 am. The workshop ends Sunday 1 July at 12:00 pm. 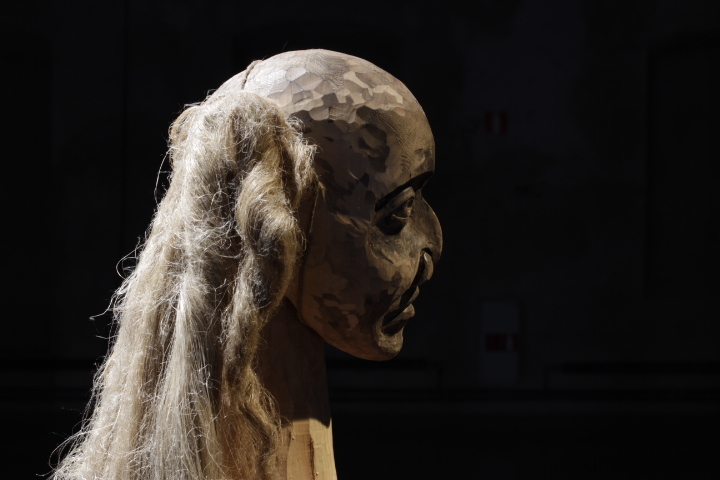 Creating a sculpture from a tree trunk requires a great effort and is not an easy task, but with a methodological approach, planning and patience it is possible! Part of a wood sculpture by instructor Julia Bondesson. During the basic course we work with practice sculptures and try out techniques that you can use to create more complicated sculptures after further practice. However, our goal during the workshop is not that the participants will achieve results like this. A nomi (Japanese chisel) being sharpened on a waterstone. 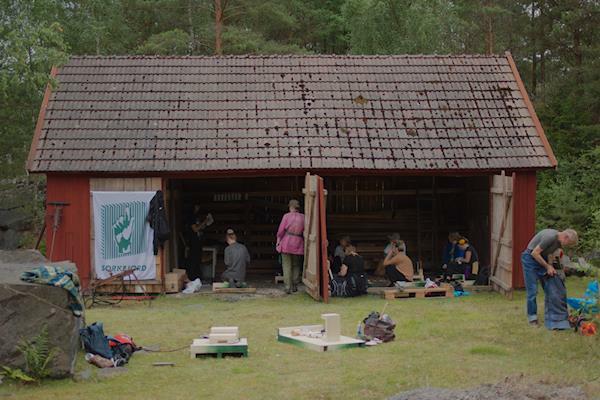 During the workshop we work in a simple weather shelter at Svarta Bergen quarry. All participants will have access to a personal workstation, consisting of a low-rise wooden platform. The work is performed sitting directly on this platform. Please note that you will be performing heavy physical work during the whole day, meaning that the workshop is physically demanding. You will sit low and use your feet to keep the wood in place against the dolly. Make sure to bring work clothes and warm clothes that are comfortable to wear when you sit down and work. The workspace at Svarta Bergens quarry. In the quarry we are surrounded by the black diabase and tools, machines and buildings used in the quarrying. Between the workplace at Svarta Bergen and the accommodation at Hjärtasjötorpet is a forest walk of 3 km and it takes about 30-40 minutes to walk. If you do not want to walk, we recommend bringing a bike. It is also possible to drive a detour by car between the workspace and the accommodation. Also be sure to bring a good hiking backpack and rainwear. Hjärtasjön lake and Hjärtasjötorpet where you will stay during the workshop, seen from the bathing jetty. The course fee includes accommodation in Hjärtasjötorpet at Hjärtasjön. 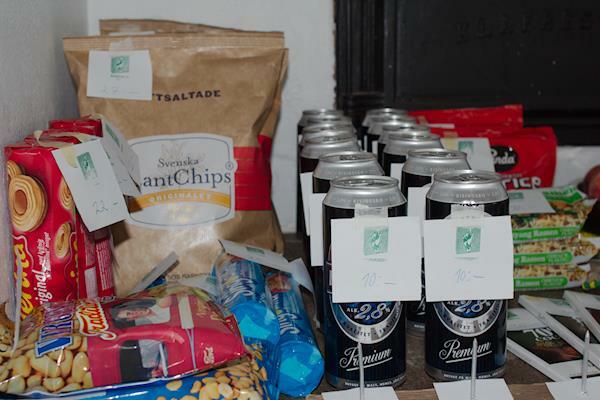 There is a kitchen in the house and the opportunity to buy snacks from Sorkfjord Performance's self-service store. The accommodation is hostel style dormitories with bunk beds, and the guests bring their own sheets. Just outside the house there are barbecue areas, a beautiful beach, a sauna and scenic walks. Animals (except humans) unfortunately do not have access to the accommodation. The participants cater for all meals themselves. In Lönsboda (3 km from the workshop) there are supermarkets, cafés and restaurants. At the Svarta Bergens arbetslivsmuseum there is a café that also serves simple lunch. During lunch hour, however, we strongly recommend that you bring your own food box, prepared in the kitchen of the dormitory or bought in Lönsboda the day before. 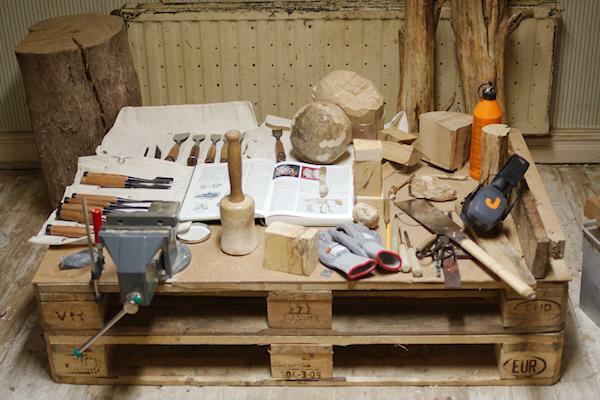 A collection of tools for wood sculpture. Gloves, cut resistant. It is important that the gloves are flexible so that you can wear them even when performing precision tasks. A container to wet the sharpening stone, minimum 180 mm long, 70 mm wide and 50 mm deep. A big ice-cream package usually serves the purpose well. Hearing protection that are comfortable and can be worn for the whole day, preferably earmuffs or custom molded plugs. Comfortable outdoor work and rain wear, suitable for working in a sitting position. Sheets for your bed in the dormitory. Backpack for the walks in the forest. Mobile phone. During the course we use a sms group to reach the participants. Sorkfjord Performance is working during the spring to develop a webshop where the tools of the workshop will be available. More information about this will be published here and in our newsletter. Alexander Wireen examines the edge of a chisel that needs to be resharpened. During the workshop we will use loupes to see what happens when we sharpen our tools. We meet Monday 25th of June at Lönsboda bus station at 08:30 am. We leave our luggage, which runs by car to the accommodation. We walk together to Hjärtasjötorpet for meeting and refreshments. The nearest SJ train stations are Älmhult and Osby. Skånetrafik's buses go all the way to Lönsboda. By car you can drive to Hjärtasjötorpet or Svarta Bergen. The main spoken language of the workshop will be Swedish. However we welcome English speaking attendees as long as they are aware of and fine with these conditions. Individual tutoring is available in English, but the lectures will be held in Swedish. Julia Bondesson mfa has studied traditional techniques of wood sculpture in Thailand and Japan. Reciever of the 2015 Beckers Award for her work with large-scale wood sculptures. 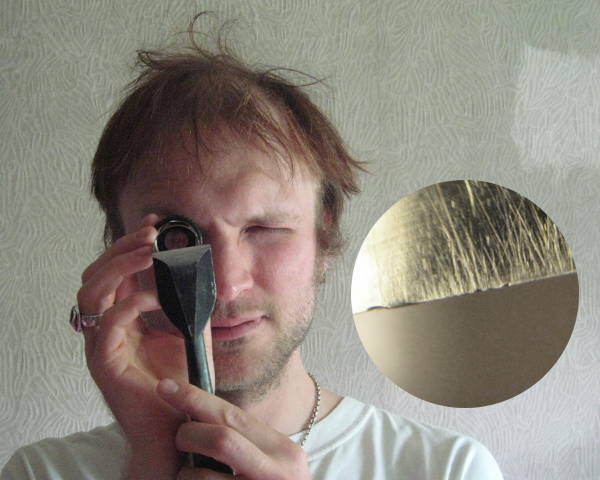 Alexander Wireen mfa works as a multi-disciplinary artist. Wireen has studied traditional Taiwanese glove puppet theatre under Master Hsu Wang of Hsiao Hsi Yuan Puppet Theatre. We are looking forward to your questions about the course! Do not hesitate to use our contact form and we will get back to you as soon as possible. The course fee is 9 500 SEK (incl. 25% VAT). Within seven days from registration you will receive an invoice by e-mail. The invoice has a payment deadline of 30 days. Counting from the day when the participant registered for the workshop the participant has a 14 day right to cancel their registration and get their money refunded in compliance with the Swedish distance purchase law. After that the registration is binding and unfortunately we do not have the possibility to refund should you not be able to take part in the workshop. We stipulate the right to cancel the workshop in the case that there are not a large enough number of participants to cover our arranging costs. In the case that we cancel the workshop, attendees that have already signed up and paid the workshop fee will get their money refunded. Be sure to check out the list of things to bring, and bring them. During the workshop Sorkfjord will take documentation photos and video/audio to be used for promoting future workshops. Your individual work might be visible and recognizable in these documentations, but we will avoid using images where your individual work is prominent as promotional images. By registering for the workshop you agree to that Sorkfjord can use documentational material like photos, video and audio from the workshop for promotional purposes. You own and dispose the wood material intended for the exercises at will. Your finished practice sculptures and other things you create during the workshop are your property physically and legally, with the exception stated above regarding that your works might be visible in photos we use for promotion. Sorkfjord will register the data you enter in the registration form (name, address et cetera). We will use your e-mail address for sending information about the workshop and future activities in Sorkfjord Performance. You can at any time unsubscribe from these e-mails by clicking on a link in the mail or by contacting us. All registered informations is for Sorkfjord's internal use only. Sorkfjord Performance do not have any incurance for the participants of the workshop. Please make sure to have a valid incurance. We are constantly working on making the workshop even better. Therefore the exact schedule is subject to change and will evolve over time. The workshop has a limited number of attendees. We practice a first-come, first-serve policy. If you sign up when the workshop is already full, you will get on the waiting list and receive an e-mail. All communication regarding the workshop will be via the e-mail address you provide. You might want to add our email address to your address book to make sure they do not end up in your spam folder. 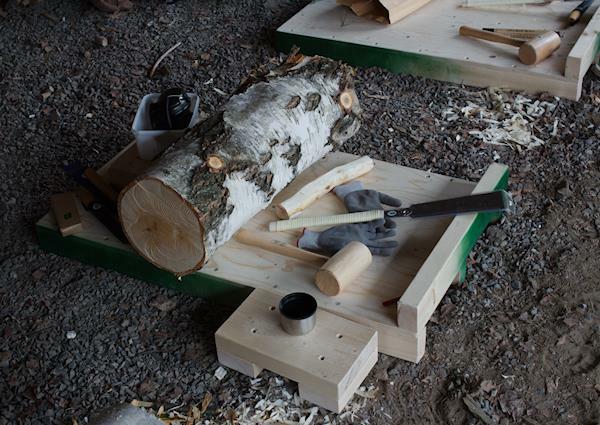 A Chinese mao mao stand for working with wood logs. The stand consists of two crosses with a stabilizing rod. 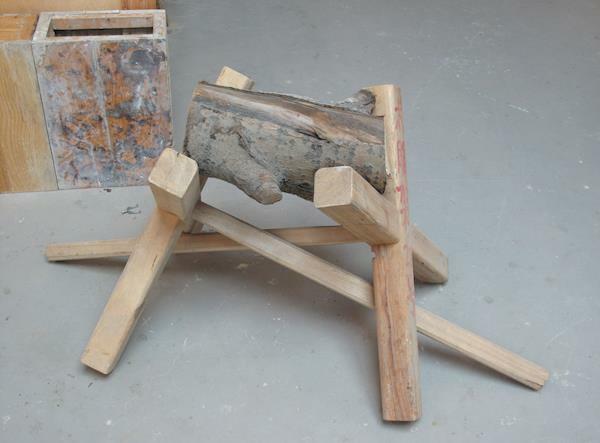 Together they form a simple and very effective stand for bigger wood trunks in the sculpture workshop.